Are you searching NEET Application Form 2018 ???? If Yes, Then Here good news for you. Central Board of Secondary Education has issued NEET UG 2018 Notification for admission to Under Graduate Medical Course in top Medical Colleges of India. 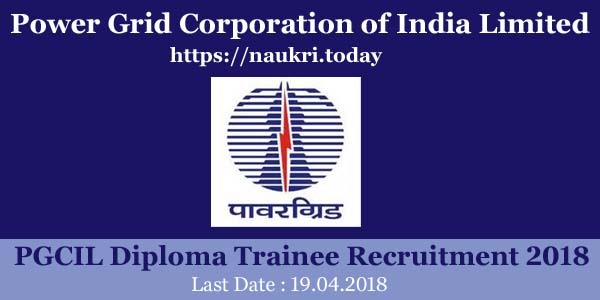 Interested and eligible candidates may apply through online mode from 08.02.2018. 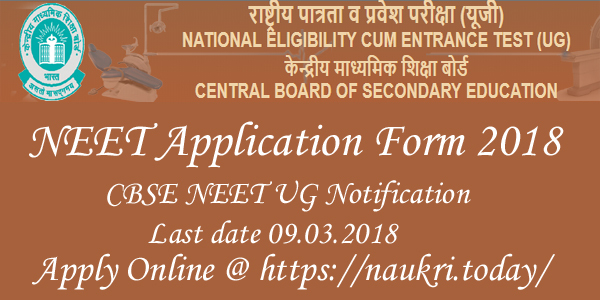 Applicants can fill CBSE NEET UG Online Form before on 09.03.2018. The Exam will be going to held on 06.05.2018. Here given below article you can collect all information. National Eligibility Entrance Test is conducted by CBSE every year. Application Form is available on NEET UG official site. Applicants should fill online form from official site or from here. In below section you can direct apply for NEET UG 2018 Exam. Further details like eligibility criteria, application fees, selection process and how to fill online form is mentioned below. Applicants should carefully read the given below details. Latest Update as on 16.04.2018 : Dear Applicants NEET 2018 Admit Card is now available for candidates who have filled NEET 2018 Online Form. Applicants who are going to attend the examination now can download NEET Exam Admit Card 2018 from here. The examination will going to be held on 06th May 2018. So Candidates can download their NEET 2018 Call letter through the below link. Latest Update as on 09.03.2018 : Dear Friends, Today is last date of filling NEET 2018 Application Form. You can correct your online form from 12.03.2018 to 16.03.2018. Exam will going to held on May 2018. NEET Online Form Registration Fees | What is the Application Fees for National Eligibility Entrance Test ? National Eligibility Entrance Test UG Online Form 2018 – How to Fill NEET Application Form 2018 ? How To Fill NEET Online Application Form ? NEET UG 2018 will get conduct by Central Board of Secondary Education for admission to MBBS/BDS course in India in Medical/Dental Colleges. The Examination framed under the Indian Medical Council of India/Dental Council of India. The admission is applicable for all India top Medical/dental colleges. Applicants who are want to admission in medical/dental colleges must obtain minimum qualifying marks. General details regarding NEET UG Exam 2018, you should read official advertisement. CBSE NEET Notification 2018 is mention in below section. Applicants who are willing to apply for NEET UG Exam 2018 must ensure that they are eligible or not. Eligibility Criteria comprises details of education qualification, age limit and others. You should read given below NEET UG Online Form 2018 Eligibility details. Applicants who qualify Higher Secondary examination with Science Stream are eligible to apply. To attend NEET UG Exam 2018 you should require 50% Marks in 12th Standard. SC/ST Candidates are require 45% Marks. Furthermore regarding education eligibility you should read CBSE NEET Notification 2018. For National Eligibility Entrance Test UG 2018 the minimum age is required for all applicants is 17 Years. Candidates maximum age limit required to apply for NEET Application Form 2018 must be 25 years. Participants should read mention below paragraph to check category wise age relaxation. Students who are belonging to SC/ST category will get 05 Years relaxation. OBC Candidates will get 03 Years age relaxation. More details regarding eligibility criteria should read CBSE NEET UG 2018 Notification. Participants who are searching application fees for NEET UG Online Form 2018 should check here. Our team mention here category wise fees details and payment method. Candidates who are belonging to General and OBC category are required to pay Rs. 1400/-. SC/ST/PH candidates are have to pay Rs. 750/- as a fees of NEET UG 2018. Participants will also pay service charges along with application fees. NEET UG Application Fees should be paid through online mode using Debit card/credit card/net banking etc. Once fees is deposit by candidates is not refunded back. So first you read full notification of CBSE NEET UG 2018 and they apply for it. Applicants who are successfully fill the application form can attend the written test. Written Examination of CBSE NEET UG 2018 will going to held on 06.05.2018. Applicants who qualify the exam will attend the counselling section of NEET UG 2018. Furthermore check official advertisement. CBSE organized National Eligibility Entrance Test in all languages. The exam is comprises 180 multiple objective type questions and duration of exam will be 03 hours. 04 Marks obtain for every right answer. NEET UG Exam 2018 also have negative marking of 01 Mark for every wrong answer. Applicants should have blue/black ball point pen to fill up answer sheet. Interested and eligible candidates may apply through online mode. Applicants should follow some given below instruction to fill up NEET UG Online Form 2018. First log on to official site www.cbseneet.nic.in. Download NEET UG 2018 News Notification and read it carefully before apply. Go to the link Apply online and go to the same. Fill NEET Online Form Step-I and note down registration number. In Step –2 upload photograph and signature. Make payment of CBSE NEET UG Application Fees in step-3. Take hard copy of application form for future uses in step-4. Click on next button and then OTP will receive on your registered mobile no. Submit application form, you can also follow instruction mention in NEET 2018 Notification. Conclusion : NEET Application Form 2018 available here for candidates who want to admission for MBBS/BDS. The online registration of CBSE NEET UG 2018 starts from 08.02.2018. Interested and eligible candidates may apply through online mode. The last date of apply for NEET UG Exam 2018 is 09.03.2018. Central Board of Secondary Education (CBSE) will going to conduct National Eligibility Entrance Test for the admissions to Undergraduate MBBS/ BDS courses. NEET Exam 2017 will conducted once in a year. To take Admission in Medical College candidate need to fulfill the requirement of NEET 2017. On the basis of marks obtained in the Entrance examination the admission will made for MBBS/ BDS Courses. As per the NEET 2017 Notification, the Online Application form had already started on 31.01.2017. Candidate may fill the NEET Application form up to the the closing date i.e. 01.03.2017. NEET 2017 Online Application Form is available on the official website. The Entrance Examination for Medical Courses will held on 07 May 2017. Candidate who are eagerly waiting to apply for www.cbseneet.nic.in Application form 2017 should check the Eligibility details, Application Fee, How To Apply Procedure, Registration Date, NEET 2017 Age Limit etc. from this page. Candidate who are going to fill NEET Application form for Undergraduate Admissions should check the further details. You can check the procedure of NEET 2017 Online Application Form, check how many seats offered by CBSE board and many other information from the below section. Minimum age of the candidate should 17 years at the time of NEET 2017 Admission or your age will complete on 31st December 2017 when you are taking admissions in MBBS/ BDS courses in 1st year. Maximum age of the candidate should 25 years at the time of NEET 2017 Examination. Age relaxation should applicable as 05 years for SC/ ST/ OBC category candidates. Candidate should have passed Intermediate (10 + 2) with Physics, Chemistry, Maths & Biology and it is must to have English has its compulsory subject or its equivalent. The NEET 2017 Qualification must completed from any recognized board or institute. As per the Indian University the candidate should have passed B.Sc. Examination with not less than two subjects which are as follows – Physics, Chemistry, Maths & Biology (Botany, Zoology)/ Bio – technology. For NEET 2017 Application form General & OBC category candidate should pay Rs. 1400/- and SC/ ST/ PH category candidate need to pay Rs. 750/- and processing/ service charges will applicable. The NEET Application Fee 2017 will paid via debit/ credit/ UPI/ Net Banking/ e – wallet along with the service tax. Before filling the NEET Application Form candidate should read the complete Notification. The NEET 2017 Registration will done in online mode. Keep all the Identity proof like Aadhaar No./ Passport No./ Bank Account No. etc. with you before filling NEET UG 2017 Application Form. First you have to decide through which mode you have to make the payment such as through debit card/ credit card or Net banking/ UPI or via e-wallet. If he/ she choose debit/ credit card mode then you have to check the card validity and at the time of logging to website keep the card with you. If the candidate select the Net Banking/ UPI/ e-wallet mode then they have to follow the instruction as mentioned at the time of NEET 2017 Online processing. After submitting NEET 2017 Application Fee, keep the fee receipt which is generated by any of the above mentioned mode for future use. Applicant who are applying for NEET 2017 Admission should check the documents needed to attach with the application form. You can also check the procedure to fill NEET Online Application Form. Remaining information are given below. You have to attach with NEET 2017 Exam Form. Passport size photo whose size is between 3kb to 20kb. Impression of the right hand index finger scan copy with size between 3Kb to 20 Kb. You should have details of Debit/ credit card or internet banking. First of all, NEET 2017 Login to the official website of www.cbseneet.nic.in. Candidate need to read the complete brochure of NEET 2017 carefully. Then after click on the Apply Online and proceed to further steps. Fill all the details in NEET 2017 Online Form. Upload scanned photo and signature which should clearly visible. The size of the photo should in between 10Kb to 100Kb in JPG format & 3Kb to 20Kb should the size of Signature. The size of the right hand thumb impression should 3kb to 20kb. After filling NEET 2017 Application form click on the next button and proceed to NEET Application Fee 2017 page. You can submit the NEET 2017 Application fee in Online & offline mode both. In Online mode candidate have to submit NEET 2017 Fee through Credit Card/ Debit Card/ Net Banking & in offline mode applicant should submit the fee via e- challan. Then after you have to click on NEET 2017 Conformation link. Recheck the NEET 2017 form and click on the submit button. Take a print of the NEET Application form 2017. Note ID & Password after the submission of NEET Online Application Form for future use. Conclusion : NEET Application form for Medical/ Dental Courses admission is available now. Interested Candidate should check NEET UG Admission 2017 and fill the online application form before the last date i.e. 01.03.2017.